Chronic Obstructive Pulmonary Disease (COPD) is a preventable and treatable disease with some significant extrapulmonary effects that may contribute to the severity in individual patients. Its pulmonary component is characterized by airflow limitation that is not fully reversible. The airflow limitation is usually progressive and associated with an abnormal inflammatory response of the lung to noxious particles or gases. Although COPD is a nonspecific term referring to a set of conditions that develops progressively because of a number of different disease processes, it most commonly refers to patients with chronic bronchitis and emphysema and to a subset of patients with asthma. Several different definitions were proposed for COPD in time. COPD is not asthma but can coexist with asthma, the other major airways obstructive disease caused by airway inflammation. Inflammation underlying in asthma has characteristic features, distinct of that from COPD. Longitudinal studies revealed the heterogeneous character of COPD. The pathological hallmarks of chronic obstructive pulmonary disease (COPD) are inflammation of the small airways (bronchiolitis) and destruction of lung parenchyma (emphysema). International guidelines stress the importance of accurately discriminating between asthma and chronic obstructive pulmonary disease. Although characteristic pathological features have been described for both conditions, their discriminatory power has never been systematically assessed. This might be rectified by improving pathological definitions. Although gastric adenocarcinoma continue to be the second continues to be the second cause of death worldwide, its incidence and mortality appear to have decreased in recent decades. Despite this decline, adenocarcinomas from proximal stomach tend to be more frequent during the last three decade. Adenocarcinomas with this location it seems that are a different, specific subtype of gastric carcinoma. The purpose of this study was to clarify the differences between gastric adenocarcinomas from upper and distal gastric pole using the immunohistochemistry. For this reason, we investigate histopathological and immunohistochemically 77 cases of upper gastric pole adenocarcinoma selected from a number of 472 gastric tumors. The immunohistochemistry was performing only in 32 cases by ABC technique with the following primary antibodies: Cytokeratin 7, Cytokeratin 19, Epithelial Membrane Antigen (EMA), Carcinoembryonic Antigen (CEA), Lysozyme, Vimentin, p53 protein, CD34 and Ki67 antigen. The acquired results do not distinguish a peculiar immunohistochemically profile unlike distal gastric adenocarcinomas. Nevertheless, we pointed out the predominance of diffuse adenocarcinomas type according to Laurens classification, which immunohistochemically were strong positive to cytokeratins, EMA, CEA and lysozyme. Moreover, investigation of some antigens likes lysozyme, p53, Ki67 and CD34 seems to be useful for prognostic estimation of carcinoma with this topography. The aim of the study was to evaluate the mast cell-blood vessel relationship using double staining CD34/AAS. Sections from 14 cases with lip tumors have been stained with Hematoxylin-Eosin. On additional sections from each case, we highlighted blood vessels by immunohistochemistry for CD34 antigen using the method LSAB2-HRP/DAB, followed by alcian blue-safranin stain for mast cells. We quantified the density, distribution and the mast cell types as well as the correlation with the number of blood vessels. All cases have been positive for both staining. We observed a significant correlation between the number of vessels and the mast cells (p = 0.003). In one case, we observed the mast cells stained with safranin (red), the vascular density being less than the mast cells density. Our results confirmed the data from the literature with respect to the large number of mast cells observed in the malignant tumors. The increased vascular density together with the mast cell density suggests a correlation between these two elements in the tumor angiogenesis, possibly though the VEGF secretion. The CD34/AAS stain is a quick and simple method and it allows an optimal correlation between the number of mast cells and blood vessels on the same section. The type of mast cells correlated with microvessel density is a powerful argument towards the involvement of the mast cells in the tumor angiogenesis of the malignances of the lips. Neurofibromatosis type 1 (NF1) is an autosomal dominant disorder, caused by mutations in the NF1 gene. The NF1 gene encoding neurofibromin protein, which is strongly expressed in the nervous system and with the role as a negative regular of the ras proteins signal. All six cases with neurofibromatosis type 1 were clinical and laboratory investigated. The frequently symptoms are "café au lait" spots and neurofibromas. In two cases, the disease is associated with essential hypertension and, in other two cases with kyphoscoliosis. The novo mutations in NF1 gene cause the disease in three cases, and in other three cases, the mutation is inherited (two cases on father side and one case on mother side). Neurofibromatosis type 1 (NF1), also called von Recklinghausen disease or peripheral neurofibromatosis, is a common autosomal dominant disorder characterized by multiple neurofibromas, "café au lait" spots and Lisch nodules of the iris with a variable clinical expression. Osseous anomalies appeared in the patients with NF1 including dysplasia, scoliosis and pseudoarthrosis. We propose a research of the osseous involvement at 11 patients, seven female and four male with ages from 9 to 60 at which the cutaneous aspect has the complete form, hyperpigmented spots and cutaneous neurofibromas and only more than six "café au lait" spots. All the patients suffered radiological exams, CT- and MRI-scan. The results were different from case to case from the extreme severe deformations, especially at the children, to clinical unapparent osseous involvement, incidental found or with occasion of our investigation. Conclusions. The patients with NF1 has osseous abnormalities specific of the disease, like dysplasia, scoliosis, pseudoarthrosis, often gentle but sometimes extremely severe. The most severe osseous involvement are presented in the cases when these development early in the childhood. Other times the osseous abnormalities are clinical asymptomatic, their finding been clinical incidental. We want to have a separate mention for the maxillary and mandible involvement, which according to our information is not a rare form. Scanning electron microscopy (SEM) of vascular corrosion casts (microvascular corrosion casting/SEM method) is a standard method, which allows three-dimensional visualization with good resolution of the normal and abnormal microvessels, including the capillaries of various organs and tissues. SEM of vascular corrosion casts can obtain qualitative as well as quantitative informations important to anatomists, pathologists and clinicians. Considering these, the history, the advantages and the main steps of this technique including general morphological characteristics of vascular casts observed in SEM are reviewed in this paper. Corrosion casts done by the author representing the microvascular organization of the rat liver and kidney observed in SEM are, also, presented. Arcuate foramen is less known trait of the human atlas vertebra formed by a delicate bony spiculum, which arches backward from the posterior end of the superior articular process. Examination of 1044 human atlas vertebra revealed that the trait was present in 13.8% of the samples. The mean length of the arcuate foramen form was 7.16 mm on the left side and 9.99 mm on the right side in bilateral positive samples while it was 8.14 mm and 9.26 mm respectively in unilateral positive samples. The mean vertical height of this foramen was 6.57 mm on the left side and 6.52 mm on the right side in bilateral positive samples while it was 4.91 mm and 5.38 mm respectively in unilateral positive samples. The sides did not show any statistical significant differences. The importance of the arcuate foramen lies in the external pressure it may cause on the vertebral artery as it passes from the foramen transversarium of the first cervical vertebra to the foramen magnum of the skull. Formation of new blood vessels from a preexisting vascular bed (angiogenesis) is a complex multistep process, which may also permit metastasis. Progesterone receptor is a surrogate marker for ER activity and has been used as an additional predictive factor for hormonal therapy in breast cancer. To investigate how tumor angiogenesis correlates with progesterone receptor (PR) status in breast carcinoma diagnosed on core biopsy, microvessels were counted (and graded the density of microvessels) within the initial invasive carcinomas of 158 patients. Using light microscopy, the number of microvessels was counted manually in a subjectively selected hot spot (in the most active areas of neovascularization per 400x field), and their values were separated as above or below median (low and high), without knowledge of the outcome in the patient or any other pertinent variable. When the mean values of MVD of the various groups defined by PR status were compared, significant difference was noted (P = 0.008557). When tumors were classified as high or low MVD, based on a cut-off value (30.70175 microvessels/mm2), cases with high MVD were significantly more numerous. MVD did show a relationship with groups defined by PR status (P = 2.03076E-05). The correlation of angiogenesis with PR status may be a potential therapeutic target for the treatment and prevention of breast cancer, using antiangiogenic molecules. The objective of the paper was to observe the ultrastructural aspects of the endometrial biopsies taken from female patients at post-menopause with substitutive hormonal therapy (TSH). Material and methods. A number of three endometrial biopsies were taken from female patients at post-menopause with TSH. The ultrastructural analysis was carried out with the help of the electronic microscope Philips ME 301 using classical electronic microscopy methods. Results and discussions. The ultrastructural analysis has highlighted the presence of cuboidal and columnar epithelial cells, with basally situated nuclei, well represented cellular organelles, some cells having at the apical pole microvilli. At the electronic microscope, three types of epithelial cells are described, at the level of the endometrial mucosa of the woman who is in a fertile period: secretory cells (cells with an average electronic density with microvilli on the luminal surface), ciliated cells and clear cells (cells with a low electronic density). These cells have certain ultrastructural characteristics and of receptivity towards the steroid hormones. The stroma is axial with elongated cells with oval nuclei, with nucleoli and with smooth or undulated membrane. Conclusions. The ultrastructural aspects suggest the presence at endometrial level of epithelial active glandular cells, secretory cells and stromal active cells at female patients at post-menopause with TSH. 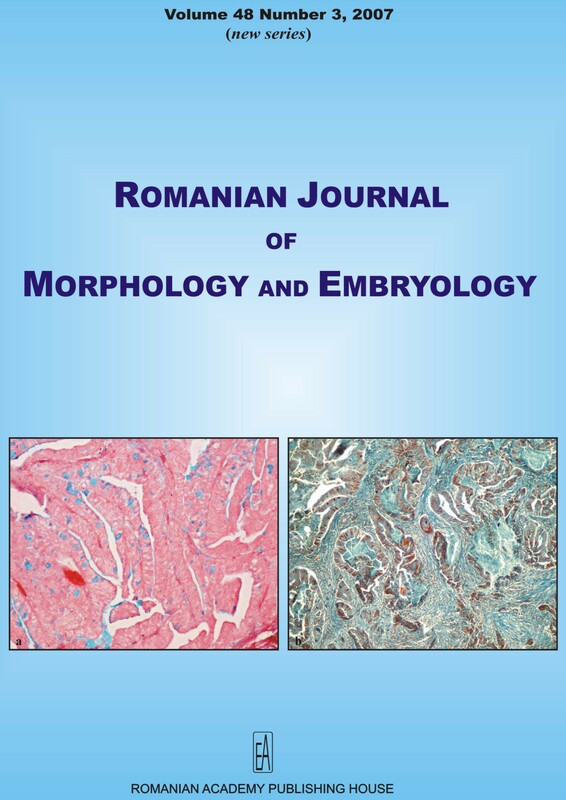 The authors present a study both upon eight crania of dead born fetuses having the vertex-coccis distance between 25-29 cm and a human embryocephalic extremity of 18 cm. The crania were examined in the lateral, vertical, frontal, occipital, basal norms. Sagittal sections were performed upon the embryo, and then those sections were microscopically examined after HE staining. We concluded that the cranial arch bones morphogenesis and the facial complex is a long-time development process, which initially started during the early embryogenesis, and it is completed as an adult. Determining factors of the flat bones osteogenesis are the following: vascular, muscle, extracell (mesenchyma) and neuronal factors (rhombencephalon presence). The aim of our study was to evaluate the role of CD20 and CD45.Ro antibodies in acne and seborrheic dermatitis. A number of 20 patients with papular, pustular or nodular acne and another 20 patients with seborrheic dermatitis were available for our study. We removed bioptic material from all of them and we perform histochemical and immunohistochemical processing within the Laboratory of Histology, Histopathology and Immunohistochemistry of the University of Medicine and Pharmacy of Craiova. In acne, we could reveal a positive CD45.Ro immunomarking in rare lymphoid cells situated in the middle derma at a distance from the affected pilosebaceous follicle and in the inflammatory infiltrate subepidermically, and also a negative immunomarking in the inflammatory cells from the proximity of the affected pilosebaceous follicle. In patients with seborrheic dermatitis we noticed a positive immunomarking infiltrate of the papillary derma and a positive immunomarking of membrane for CD45.Ro in many lymphoid cells of the inflammatory infiltrate situated in the papillary derma predominantly disposed perivasculary. Conclusions. The absence of the cells marked with CD45.Ro in the proximity of the pilosebaceous follicle interested in acne excludes the direct participation of B- and T-lymphocytes in the perifollicular inflammatory process, though the T-lymphocytes can be revealed in a small number at a distance from the affected follicle. The inflammatory infiltrate from the seborrheic dermatitis proved to be rich in positive CD45.Ro cells and poorer in positive CD20 cells. The purpose of this study is to evaluate the value of cytokeratin (CK) MNF116 and vimentin in the differential diagnosis of malignant pleural effusions. There were evaluated smears from 30 patients with pleural effusions stained with May-Grunwald Giemsa and Papanicolaou techniques for the routine cytological diagnosis. Additional smears were immunostained with CK MNF116 and vimentin using LSAB2 technique. Two independent observers evaluated all smears. Smears were classified first by cytological examination in seven cases (23.33%) as benign, and in 23 cases (76.67%) as malignant pleural effusions. Mesothelial cells expressed CK MNF116 in 96.67% (29/30) of cases and vimentin in 33.33% (10/30) of cases. Malignant cells expressed CK MNF116 in 52.17% (12/23) of cases and vimentin in 30.43% (7/23) of cases. The pattern of immunostaining was diffuse cytoplasmic. In conclusion, CK MNF116 and vimentin may be used as a part of the panel of antibodies for differential diagnosis of malignant pleural effusions with primary unknown. The omohyoid muscle is one of the infrahyoid muscles with superior and inferior bellies. Variations of this muscle are clinically important because of its relation to the internal jugular vein as well as its significance in radical neck dissection. A duplicated omohyoid was observed during routine cadaver dissection, which is attached along with the usual inferior belly of the omohyoid into the transverse scapular ligament. Knowledge of anomalies of this muscle is important to minimize the complications during the surgical procedures of cervical region. We report a case of primary anorectal melanoma, a very rare malignant tumor in this localization. The patient, a 57-year-old female, complained for one year of symptoms, which were attributed to hemorrhoids. An abdomino-perineal resection was performed. Pathologic examination revealed an anorectal melanoma with numerous lymph node metastases and an unusual metastatic deposit in a uterine leiomyoma. The pathogenesis, pathology, principles of treatment and prognosis of this entity are briefly discussed. Retroperitoneal sarcomas are rare malignant tumors, which are developing from mesenchymal stem cells residing in muscle, fat, and connective tissues. Underlying the rarity of this kind of tumors in general population, the aim of this paper is to present three cases of retroperitoneal sarcomas operated in Surgical Department of Military Hospital of Craiova (a retroperitoneal liposarcoma, a dedifferentiated liposarcoma and a malignant fibrous histiocytoma). From clinical point of view, we note the poverty of symptoms and non-specificity of these and a great tolerability of retroperitoneal space that offers the possibility for a great development of the tumor. CT-scan and MRI are the best investigations for diagnosis but surgical exploration is the best way for a good evaluation of these tumors. From histological point of view, we try to present new features about these kinds of tumors in order to classify them. Results of surgery correlated with complementary therapies were good without per-operative mortality or postoperative morbidity but we noted a recidive of one tumor (with different histological pattern) 21 months after the surgical intervention. The rarity of retroperitoneal sarcomas, combined with the vast array of histologic subtypes, has complicated our understanding of these tumors and impeded the development of effective therapies. Primary pure small cell carcinoma of the urinary bladder is an extremely rare and highly aggressive tumor with an average five-year survival rate of less than 10% as cited by multiple case reports. It accounts for about 0.5-1% of all bladder tumors. We present the case of a 44-years-old man, smoker (10 cigarettes/day) hospitalized in the Department of Urology, from the "Prof. dr. Th. Burghele" Hospital, Bucharest, for one month intermittent hematuria. Ultrasonography showed a sessile tumoral mass, sized 37/30 mm. Transurethral resection of the tumor mass was performed and tissue fragments were sent to the pathologic lab to establish the histologic type, the degree of differentiation and invasion. Fragments of the tumor were fixed in 10% formaldehyde, paraffin embedded and processed as standard technique; the sections were stained with HE, VG and immunohistochemically with: CROMO, EMA, NSE, CD56, NK1, p53 and βHCG. The microscopic examination revealed a tumor proliferation composed of two distinct components: extensive small cells areas and foci of typical low-grade (G2) papillary urothelial carcinoma. The small cell are uniformly, round, with increased nucleo-cytoplasmic ratio, eosinophyl cytoplasm, hyperchromatic nuclei, finely granular chromatin and inconspicuous nucleoli. Immunohistochemical stains showed diffuse positive staining of the small cell component for CROMO, EMA, NSE, CD56, NK1 and urothelial carcinoma component stained focally for βHCG. The rate of cell proliferation was increased (p53 - 80% positive reaction). Conclusions. A diagnosis of small cell carcinoma coexisting with low-grade urothelial carcinoma was established. Because of aggressive behavior and distinct treatment, the pathologist should watch out for the presence of small cell carcinoma component.